It’s officially summer now, which in my head stands for long lazy days and getting slow from the heat. I thought I would probably get a bit lazy with my sketching, so I made myself a thirty (actually thirty-one) day creativity challenge for July. And yes, you can participate. In fact, it would be pretty awesome if you did! In the past I already did a drawing challenge and a photography challenge. This time I decided I didn’t want to make it too hard. This challenge is all about being creative and it doesn’t matter how you do this. If you want to make 31 pictures that is awesome. If you want to switch between collages and finger painting that is equally awesome. It doesn’t matter how serious you take this or how much time you spent on it, the only thing that really matters is that you push yourself to be creative every day. I came up with 31 daily prompts, which I (and hopefully you too) will use for daily inspiration. Click on the image to see a bigger version of the image (or click here for the Dutch version). 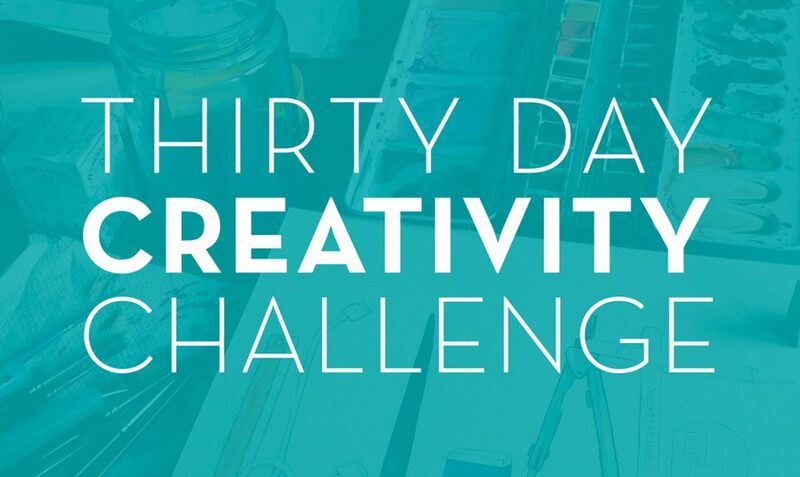 Update: Upon request I made a printable version of the Thirty Day Creativity Challenge. You can download the English version or the Dutch version. I’ll post my creativity challenge creations daily on my Instagram account and I might put up an overview of my favourites once or twice during the month of July. Let me know (in the comments below or on social media) if you’re going to participate.